Historic downtown Rochester has vibrant culture, captivating views of the High Falls, and an eclectic mix of events to attract quite an array of residents. People from all walks of life—including young professionals, artisans, “empty nesters,” and college and music students—call Center City home. The busy Riverside Convention Center, with its revolving roster of expos, home, garden and other shows, such as Mini Maker Faires and annual family friendly New Year’s celebrations; the Blue Cross Arena’s roster of sports and musical events, and GEVA Theatre performances as well as the Central Rundel Library are all walkable to downtown residents. Longer trips are just a bus ride away with the newly completed RTS Transit Center on Saint Paul Street serving as the hub for the region’s transit network. SUNY Brockport Small Business Assistance Center and the Rochester Institute of Technology (RIT) Center for Urban Entrepreneurship. The University of Rochester, RIT, SUNY and Monroe Community College are major educational institutions that offer courses and other learning opportunities at central city locations. Center city offers both residents and tourists The Strong National Museum of Play, the Rochester Contemporary Art Center, the iconic Little Theater and its annual High Falls film festival, the Eastman School of Music and Eastman Theatre. 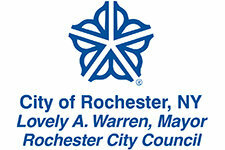 The area is host to beloved outdoor events such as the newly established Fringe Festival and the International Xerox Rochester Jazz Festival. The landmark Water Street Music Hall is tucked away near the Genesee River. Several pocket parks host warm weather concerts and events. Recently revitalized buildings house state of the art rental opportunities. 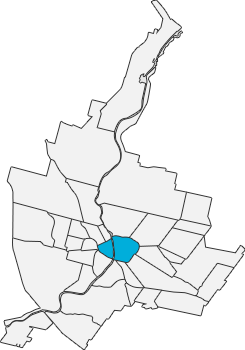 Surrounding Rochester’s center city several distinct neighborhoods are tucked within the central business district, each with its own unique vibe and culture. 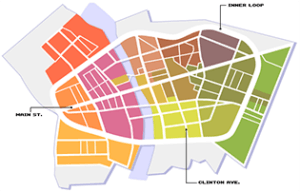 Situated right off of Main Street is Grove Place, the oldest continuously occupied residential neighborhood downtown. Adjacent to the Eastman Theater and School of Music, this artistic enclave enjoys close proximity to music and cultural events, many of which are free and open to the public. Beautiful 19th century brick row homes and small Victorian “cottages” that originally housed working class residents are now occupied by house members of an exceptionally close-knit and active neighborhood association. The St. Paul Quarter, originally known as “Clothier’s Row,” is currently undergoing a major revitalization that will bring exciting new retail and dining options to the neighborhood. Composed of 19th and early 20th century industrial buildings, these new offerings will expand the existing mix of beautiful high-end loft apartments, offices, and retail space appealing to artisans and creative entrepreneurs. The growing artisan cooperative Rochester Makerspace calls the St. Paul Quarter home. Moving down the central artery of East Avenue puts you in the East End, home to the internationally renowned George Eastman Museum, a variety of performance venues, including the new Lyric Theatre Opera and some of Rochester’s most popular restaurants, bars, and nightclubs.